Eating at a roadside dhaba is always fun, the food tastes more homely and its affordable too. One of the oldest eating joint (dhaba) here is the Karjat Dhaba, which came up way before Karjat got commercialised and small joints sprung up at every nook and corner. This roadside joint is situated after the Neral-Karjat junction on the stretch leading to Karjat Chowk. Few years ago the place was like a proper dhaba, it just had a roof with few tables laid, and it much more open and airy. Now with more restaurants coming up in the surrounding area, it has transformed into a proper place with a permit room. Karjat Dhaba use to serve beer earlier too, except that now steel glasses have been replaced by beer mugs, and its served more openly. You will get Indian and Chinese cuisine here, although we wouldn't recommend Chinese food. Many restaurants have Chinese on their menu, it isn't really the place to eat Chinese. Better to have the local delicacy, vada-pav, instead. While the Indian fare was delicious, almost all the vegetarian and non-vegetarian dishes are available. We had beer first then followed it up with Paneer Masala and Aloo Mutter along with hot chapatis, and were quite happy with the food. So we ordered for rice and dal fry, to have a complete, delectable meal. The place wasn't crowded, so the service was quite prompt. The bill came up to Rs 240, good enough for two people. 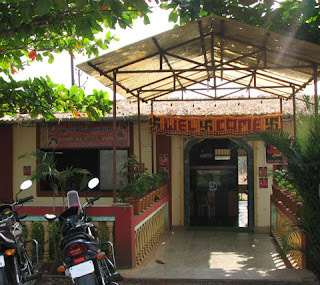 Next time you visit Karjat, drop by the dhaba for some good food. 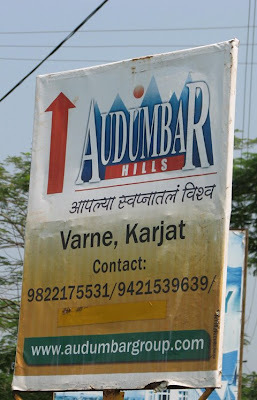 Like many hill stations of Maharashtra, Karjat too has become a victim of rapid urbanisation. 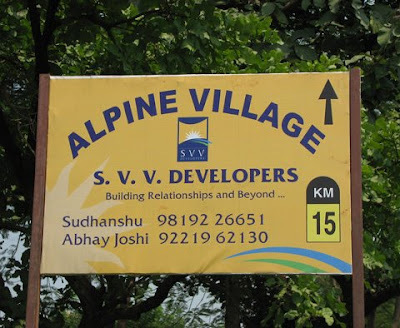 More and more land is being used to develop townships, hotels and bungalows. So paddy fields have given way to new development, and villages also have been acquired for the SEZ plan in Raigad district. This is pretty evident when you get off the highway and take the left to enter Karjat. 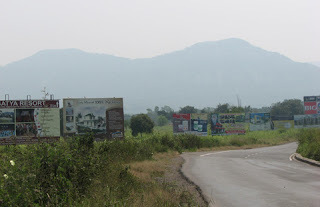 You will notice the change in landscape, with both sides of the road filled with slew of hoardings advertising about future development projects or some real estate agent selling land. Land under cultivation has reduced drastically and the state's agriculture commissioner, Prabhakar Deshmukh, admits that this is a worrying trend. This has been happening in other parts of Maharashtra too. 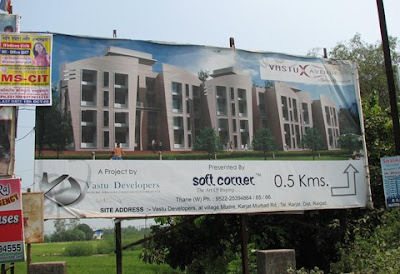 Due to close proximity to Mumbai, the demand has gone up and with it the cost of real estate too in Karjat. 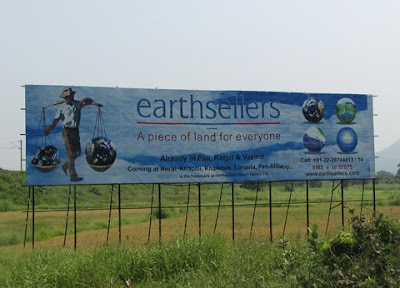 Earthsellers, what an apt name to describe the current scenario, piece of land for everyone and less land for cultivation. Another slew of hoardings as we reached closer to Chowk. 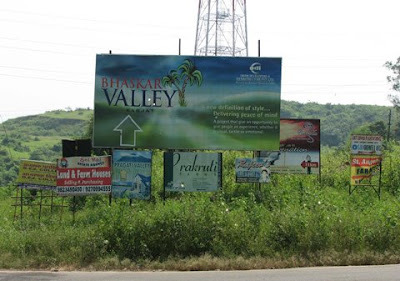 Several new townships are coming up as well within and on the outskirts of Karjat. This surge in development only started around 2-3 years ago. 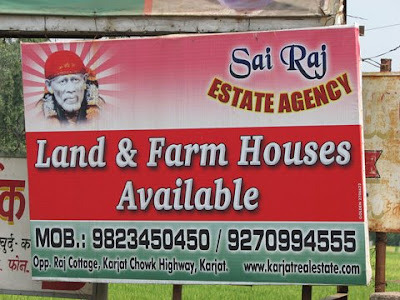 Are you looking for a piece of land in Karjat too?